RP50390 is rated 4.2 out of 5 by 23. Rated 5 out of 5 by GBS from Just what I needed The Hose assembly was exactly what I needed.Simple to install. I now have more water pressure than I ever had.. Rated 5 out of 5 by Paul from Perfect! Purchased a few months back. Delivery was prompt and the product installed in seconds. Seems to work even better than the OEM part! Rated 1 out of 5 by Getting wet from Wrong clip, wrong hose. This hose was listed as a replacement hose for my Delta faucet. Not only is it the wrong hose but the clip they picture is not the clip you get. The clip you get will not work with most standard Delta faucets. This allows the end to pop off and spew water. Rated 5 out of 5 by bmanderson98 from Problem solved We were seeing black flecks in our hot water. After some internet searches, we tried replacing the hose to the faucet as a first step. I'm thrilled with the part - especially since the problem is resolved, and it was easy to install. Rated 4 out of 5 by Brenda from Great Hose Was a tough time getting it, but customer service people were great! Rated 2 out of 5 by Thomas Palson from I got the new hose to work! I had to take and grind two flats on the bottom, where the connection is made with the plastic clip. Otherwise it wouldn't hold under pressure. The clip was different than the original. Rated 2 out of 5 by beanchip from works The hose assembly and clip replacement part is easy to install and works well. However for the price, the quality is just not there. It is already worn at the faucet and I am sure it will need to be replaced again with in the year. Should last longer with normal everyday use. What is the material of the inner tube? How do I release faucet quick disconnect on Delta B3511LF-PPU? Have mistakenly installed with cold and warm faucets reversed. Must I reconnect, or may I adjust the faucets as installed to work properly? Is hose assembly rp50390 an acceptable replacement for assembly rp32527? Jim, thank you for your question! Delta part numbers RP50390 and RP32527 are not interchangeable. We recommend the use of Delta part number RP44647 (nylon braided hose) as and interchangeable replacement for RP32527. 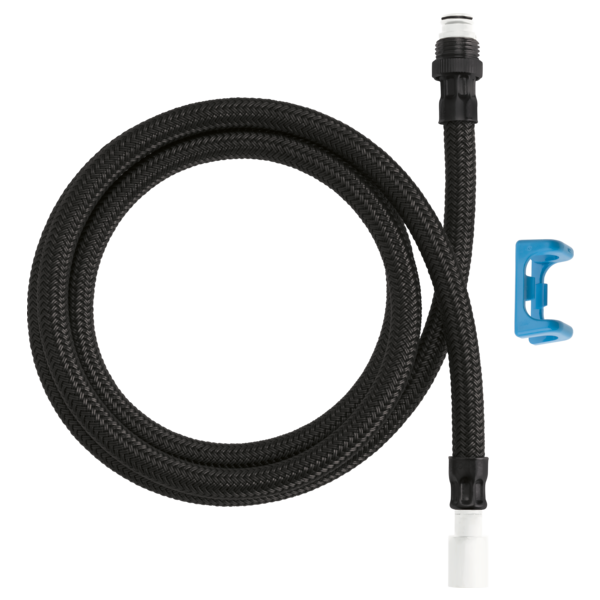 Do you make a longer version of this hose (RP50390) or an extension? I would like a longer hose for filling my Kuerig. Maybe you make an extension of like 8 inches? What is the water intake pipe's diameter? I want a faucet that will give the most water per minute available for home kitchen faucets. My current one has a copper pipe water entry diameter of 3/8&quot;. Thank you for your question. Delta Faucet kitchen faucets all have a 1.8 gpm at 60 psi flow rate except for a couple of models that have buttons to increase the flow rate temporaily to 2.2 gpm at 60 psi. The flow rate is controlled by the aerator so the size of the inlet pipe is not a factor. Can I purchase the oring only for the quick connect hose? If so what is the part number?